Look out Porsche Cayenne and Bentley Bentayga. 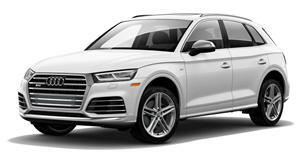 Audi has made no secret of its desire to expand its Q-named SUV lineup. 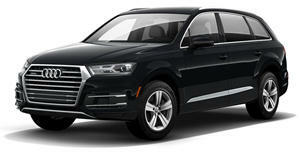 Right now, the biggest one you can buy is the Q7, but very soon the Q8 will arrive. Although slightly less roomy inside, its exterior dimensions are clearly sportier, therefore more attractive. These latest spy shots from our always intrepid photographers prove that point. The test mule you see here is apparently the upcoming SQ8, the more powerful version. How can we tell? Check out its quad exhaust pipes, a clear-cut sign of its performance capabilities. Speaking of which, what will be under the hood? Right now there are only rumors we can’t fully confirm, but we have heard it could be powered by the familiar 3.0-liter TFSI V6 that on its own produces 444 hp. However, as the Q8 concept previewed, a 20 kWh electric motor could also be there to provide some assistance. If so, expect a combined output of around 470 hp and 516 lb-ft of torque. Sources tell us it’s also possible, though unlikely, at least in the US, that a diesel version of the 4.0-liter twin-turbo V8 with 435 hp is also possible. Whatever the final engine options are, there’s no question the Audi SQ8 will be a heavy hitter in the performance department. In these spy shots we can also see it being benchmarked against a Porsche Cayenne, its . The Audi’s interior will feature the brand’s Virtual Cockpit technology and that always wonderful Audi build quality throughout. Four-wheel steering is also very likely. In short, the production Audi SQ8 will be loaded with technology and luxury. , which looked around 95 percent production ready, we could see the Q8 and/or SQ8 debut as soon as next month at Geneva.